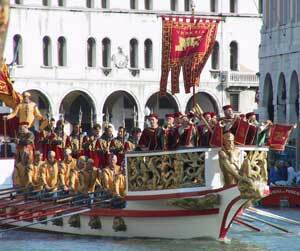 Every year, the first Sunday of September, the Historical Regatta comes back in Venice, the most traditional among the venetian events, which took place for the first time the 10th of January 1315 under the rule of the doge Giovanni Soranzo. 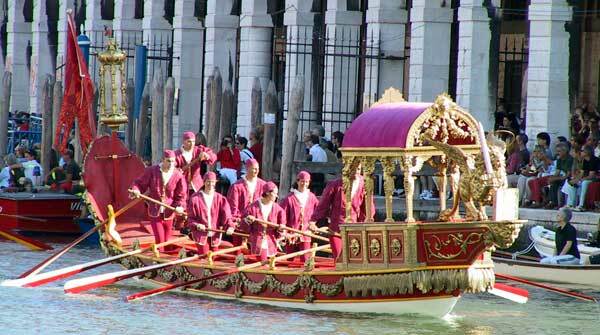 The sumptuous event, organized in the Serenissima times to celebrate the military victories or to honour the foreign dignitaries, today is made up of two different parts: the historical parade and the rowing boat races. 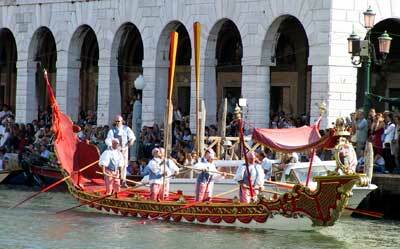 The Historical Regatta starts out with the colourful procession on water, formed by the Bissone, the Bucintoro and the boats of the venetian rowing clubs; the event commemorates the Queen of Cyprus, Caterina Cornaro, coming to Venice, which marked the beginning of the Serenissima rule over the Mediterranean islands. The historical parade has now just a picturesque importance, memory of the distant economical and political greatness of Venice on the seas, while the regattas represent still today the climax of the agonistic season in the world of the rowing alla veneta: winning that day for the rowers means to become a part of the history of this sport and, to a certain extent, of Venice. 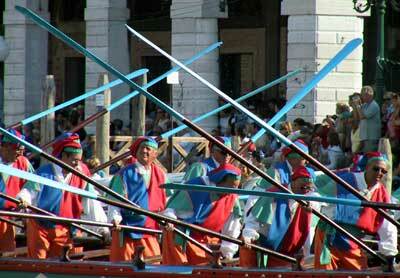 To whom is going to be present for the very first time to the Venice Historical Regatta, we give some basic information about the races, reminding that in the old days they were open to the citizens of all the Serenissima Republic possessions while today only venetian rowers take part in them. The first race after the historical parade is the Youngster Rowers one, on two-oared pupparini, very technical boats that challenge the ability of the promising young men. Then it´s the turn of the Women´s race on mascarete (the name comes from the boat nose looking like a mask, the bauta), these are light two-oared boats used in the old days by the courtesans. The third race to start is the Men´s one on heavy six-oared caorline, these are river-transportation boats almost out of use nowadays, that were often furnishened with a sail while travelling through the lagoon. Winning in Canalasso, as natives call the Grand Canal, is still today the most aspired wish of every racer, besides being the forbidden dream of many Venetians that are still rowing alla veneta. As the tradition of this sport goes, the first placed in the challenges of the Venice Historical Regatta are awarded the red flags, the following three the white, green and blue flags, these are the awards that in Venice take the place of medals. Until few years ago, together with the symbolic prizes, there were traditionally also some in kind awards; the most famous of them was a little living pig, that would parade on a gondola for its own in the historical parade. Its passing along the thick boat hedge of the public was like a thermometer of the Venetians feeling towards the city government; when it wasn´t satisfying, the pig would be acclaimed with whistles and screams such as: "Here´s the Mayor, long live the Mayor !". The pig ceremony has been abolished since few years ago, officially after the protests of some animal protection Organizations. The last technical note is about the Venice Historical Regatta route; it goes from Riva degli Schiavoni, where the start is, to Punta della Salute where, after the cavata (the start sprint), the public waits impatiently for the first boat entering the Grand Canal, since often that will be the winning one. Then (except for the race on pupparini ending up in front of Ca´ Foscari) the boats go up the Canal Grande to the train station where the turning pole is, then they go back towards the finish line in front of the Machina (the floating stage reserved to authorities and built for this occasion on the Grand Canal in front of Ca´ Foscari). When the various usual accusations of incorrectness are over, in front of the Machina the prize-giving ceremony takes place. 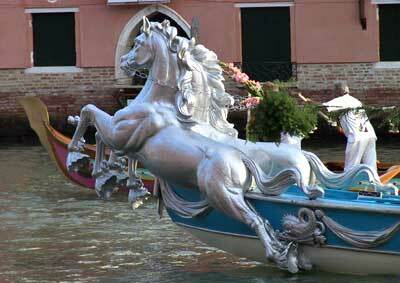 Clic on the image below to access the veniceXplorer.net image bank photos about Venice Historical Regatta. Venice Historical Regatta and hundreds other Venice photos and of various subjects in the Photo Gallery of venice eXplorer .net.